Urban data must be managed, visualized and analyzed, taking into account all legal, code regulations, utility and site planning as well as legacy data and geography. 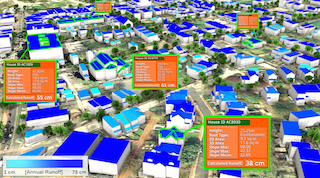 CityGML provides an open data model and XML-based format for the storage and exchange of virtual 3D city models from the Open Geospatial Consortium (OGC) and ISO TC211. A plethora of companies are providing products for 3D cityscape technology, and providing GIS to be able to manage, visualize and analyze all the information that makes up an entire metropolis. Some cities have already adopted 3D city technology. The Netherlands’ national policy for information sharing includes the OGC City Geography Markup Language (CityGML) Encoding Standard that provides a common way for modeling and encoding 3D urban content, because it is accurate and easily integrated. CityGML also provides widely available elevation data and physical infrastructure data that are very valuable to a country where 2/3 of the land is vulnerable to flooding and is also heavily populated. Berlin also commissioned the creation of a citywide 3D model that is available to all, and encoded in CityGML. Other forms of data important to 3D cities include civil engineering data as well as architectural CAD data and Building Information Modeling (BIM) data. Data encoded using the Industry Foundation Classes (IFC) an ISO standard for BIM issued by the International Alliance for Interoperability (IAI) can also be incorporated into CityGML. Bentley 3D City GIS Provides Secure Centralized Database for Rapid Access to Intelligent 3D Data. The OGC Land and Infrastructure Domain Working Group (LandInfraDWG) is focused on determining how to best integrate and support the LandXML schema within the OGC framework, as well as how to better manage and integrated CAD based information with other OGC standards. LandXML data is valuable to the larger geospatial data community but the format is not currently integrated with any of the OGC’s or ISO’s geospatial standards. 3D buildings and cities have been part of Google Earth for nearly two years. Google starts with 3D maps, generated via stereo photogrammetry from aerial imagery then converts city data to full 3D that was automatically generated. Google’s way of being able to provide visualizations of new cities quickly in 3D, gives users the immediate, rich experience of a city. Even though resolution isn’t always as sharp as you would find in an application whose business it is to model buildings and terrain, this is accessible to a great many people who are non-traditional GIS or CAD users. The combination of Google Earth and Google SketchUp however, allows users to use the SketchUp tool for preliminary drawings of buildings and the cities they populate. Google’s influence on the world of 3D has fueled a movement among technology providers to provide tools that are easier to use and can be used by many non-technical people. Google also updates their satellite imagery twice a month. 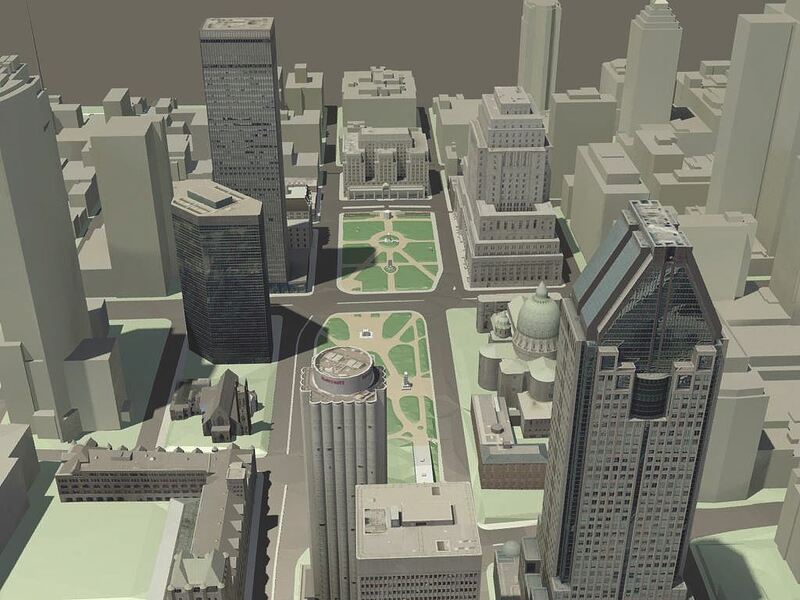 The main challenge for 3D cities according to Francois Valois, director of Product Management for Bentley Systems, is that the data set size is so big and requires enterprise tools. Bentley Map is a powerful 2D/3D GIS and mapping software where engineering and geospatial information is unified. It includes interoperability, mapping 3D modeling, terrain modeling, point cloud processing embedding with advanced point cloud processing. Enhanced interoperability with Esri’s File Geodatabase, without the need for an Esri license. Interoperability with Oracle 12C, the latest release of the Oracle Spatial database, and also support Oracle Spatial Textures for 3D city models, and their new Spiral support for information mobility. CityGML added texture support, and can add full blown 3D city models that are shared. Enabled Bing Maps support, can procure Bing Map account and leverage that in Bentley products. Advanced point cloud processing so users can create geospatial assets directly from point clouds. Another challenge is underground utilities mapping. For that Bentley offers Subsurface Utility Engineer (SUE) software that allows people to take the 2D GIS presentation and represent it in 3D for engineering purposes. “When they make a new design they need to bring that data back to the 2D GIS. That’s what we call ‘information mobility and BIM,’” says Valois. Autodesk InfraWorks 360, a planning and design software solution that enables engineers to convey preliminary design intent in a real world environment This product combines cloud-enabled collaboration with automated rich 3D model-building. 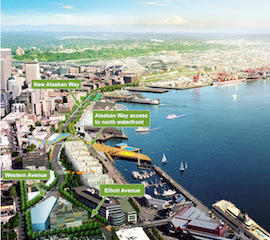 Of all Autodesk’s visualization products, InfraWorks is best suited to enable city stakeholders to visualize the breadth of a project. AutoCAD Civil 3D, a civil engineering and design and documentation software that supports BIM workflows . Autodesk C-FACT for Cities is a “Corporate Finance Approach to Climate-Stabilizing Targets (“C-FACT”)” approach that offers a free, openly available tool to help cities set science-based climate targets. This is available as an online tool to help city leaders to calculate GHG reduction targets that are in line with scientific climate stabilization targets from the Intergovernmental Panel on Climate Change (IPCC), and in proportion to cities’ relative GDP growth. Included in Esri’s 3D GIS are ArcScene, 3D Analyst, and CityEngine, all familiar to Esri users. In the 10.3 release there will be a new application to this product family called ArcGIS Pro. 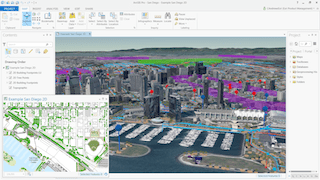 Esri’s new ArcGIS Pro that comes standard with ArcGIS 10.3 allows users to view and create 2D and 3D maps and designs simultaneously. Data courtesy of City of San Diego. Esri tackles the challenge of quickly creating informative maps for spatial analysts, when maps are needed immediately for predicting natural events and their impact on existing structures and cities. ArcGIS Pro will allow users to quickly create maps and visualizations in both 2D and 3D. Spatial analysts will be happy with the analytical tools that allow them to explore a problem from all angles. By publishing content created in ArcGIS Pro to ArcGIS Online, non-technical users can view visualizations through a web-browser-based interface. Other tools include ArcGIS 3D Analyst, an ArcGIS for Desktop extension that allows users to conduct 3D analysis and answer questions. These tools can help determine the contour, slope and elevation of a landscape; assess the size of the shadow cast by a proposed building, or the geology beneath the surface of an area. 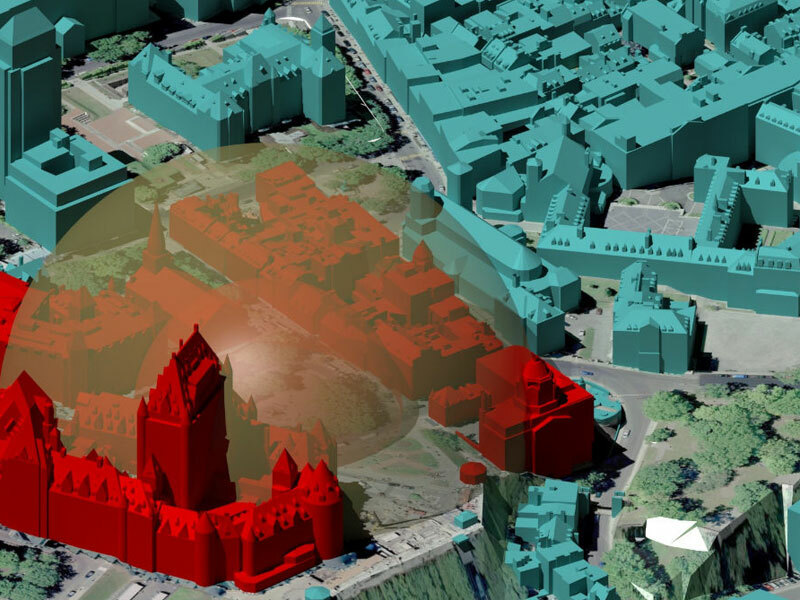 ArcScene is a 3D visualization application that allows users to view your GIS data in 3D. With ArcScene users can overlay many layers of data in a 3D environment. 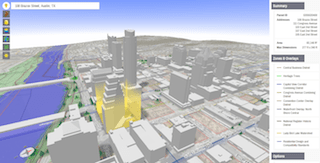 Esri’s CityEngine is advanced 3D city software for urban planners, architects, and designers to create alternative versions of environmental change or proposed assets using procedural modeling. CyberCity 3D is a 3D modeling company specializing in 3D GIS buildings. Their high detailed models are produced using photogrammetry of stereo imagery and include automated attribute fields such as building height, slope of roof, and orientation. All participants in this questionnaire agree that the costs are coming down for 3D Cities solutions. According to Lance McKee, senior staff writer for the OGC, new and more efficient data collection strategies will help drive costs down, and processing technology will continue to advance the processing of point cloud data and high volume data such as photomosaics. All these technology advancements will result in lower cost 3D content. 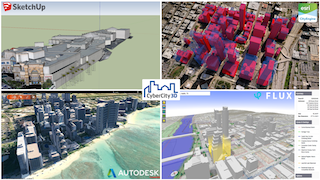 According to DeVito at CyberCity 3D, the lowering cost of 3D solutions is fueled by higher efficiencies in imagery acquisition, expanded open-source data such as OpenStreetMap, and greater GIS functionality. “More and more cities are buying LiDAR surveys of their own cities and regions, either to update their flood data or for other reasons, which is driving down the cost of 3D source material,” says Patrick from Esri. In addition, the automation of the creation of 3D buildings for cityscapes is being offered by companies such as EagleView’s Pictometry and Acute 3D. Because of the widespread number of government organizations who have Esri license agreements already, those organizations already access to a large amount of Esri 3D technology. Valois of Bentley said that although the costs are coming down, 3D Cities is still not a cheap undertaking. However, the 3D city model created from the architect’s plans rather than survey data can make the process easier. The accessibility of point clouds, drones and imagery is all part of what Bentley calls “reality modeling.” “We’ve put a lot of effort into being able to model reality as cheaply as possible,” said Valois. Reality modeling serves as the basis for design, planning, construction and ultimately operations. A key technology in making 3D modeling of urban environments affordable is the power of cloud computing. That, combined with more affordable software access options, make the management of 3D city models possible on more devices, making the technology far more mobile and facile. Autodesk’s “pay-as-you-need, pay-as-you-go” subscription program allows users to take advantage of state-of-the-art technologies more affordably. The potential for 3D Cities technology touches every aspect of the built environment. “There are a lot of things you can do with that: architecture, urban planning, noise analysis, flood analysis, underground, and avoid clashes with new infrastructure that may be being built,” says Francois Valois. 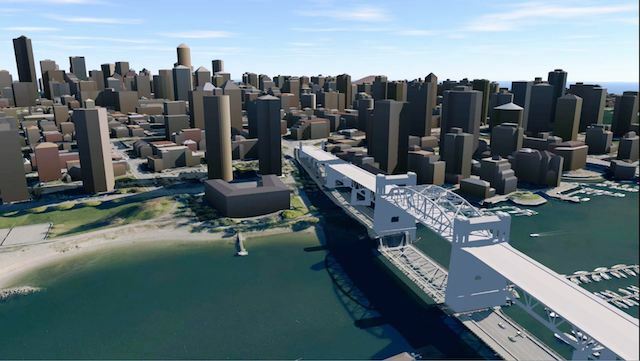 Autodesk sees cities across the world beginning to realize the value of city-scale BIM modeling for urban planning and design. They cite the growing collaboration between software developers, such as Autodesk and large engineering firms and municipalities, as another big factor in the growth of 3D Cities. 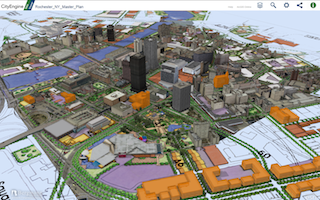 In 10.3 Esri introduces a new way of working with 3D using Web Scenes. This will enable 3D to work across the ArcGIS platform on servers, desktop, browsers, and on devices. Over time, users will share 3D virtual scenes so that others will be able to interact with the scenes as well as mash them up and use them in analytical processes. Whether 3D city data is being used for design, planning, construction, operations, or whether users are taking the data from point clouds, photogrammetry, 3D BIM models, or just taking a 2D footprint and extruding it, the goal is to provide a more realistic picture of the entire community. The ability to perform simulations during the early stage of design will lead to better urban planning decisions. Early adopters, which include a surprising number of cities worldwide, have already seen 10%-25% increase in efficiencies by adopting this approach to their cities. The wide reaching number of industries that can be served by 3D Cities technologies has yet to be tapped. Besides the governmental bodies, there are community health organizations, environmental standards groups, DOTs, and other stakeholder organizations in cities that can benefit. The technology will demand and facilitate greater collaboration and data sharing between involved parties, in a world where trust is not always forthcoming. Hopefully the new collaborative climate will foster a shift in people’s thinking and create not only more livable cities but also create more collaborative working environments for those responsible for building the projects. Data from terrain maps, aerial photographs, GIS data, building models & more used by a team at Autodesk to create a proof-of-concept 3D model of the City of Los Angeles. Image Courtesy of Autodesk. integrative planning needs of those looking to develop vibrant, sustainable communities. City of Bamberg Planning Office used Autodesk InfraWorks to create a large-scale model to help communicate the impact of a major rail expansion project. Image courtesy of City of Bamberg Planning Office and Autodesk. Esri CityEngine make it possible to simulate the impact of design elements such as green roofs and medians against key performance metrics such as storm water infiltration rates. Image courtesy of Esri. This entry was posted on Friday, November 21st, 2014 at 6:36 am. You can follow any responses to this entry through the RSS 2.0 feed. You can leave a response, or trackback from your own site. My name is Len Bundra, I am the IT & GIS Director for the Toms River Municipal Utilities Authority in Ocean County, NJ. I have spent the last twenty years developing GIS (Geographic Information Systems) for both public and private utility companies. Most large utility companies throughout the US and the world, utilize GIS to map the location of their underground or overhead utility lines. This mapping information is normally deployed to field via Toughbooks mounted in their vehicles. This allows crews to reference the map on the ToughBook and “see” what utility lines are below or above the ground/road they are working on. Ninety-five percent of all GIS implementations for utility companies (e.g. Electric, Gas, Water, Telco, Sewer) utilize ESRI Inc. software to develop, maintain and deploy their GIS data. I have been working with ESRI based systems since 1994 and have recently had much success in exporting the utility lines with attached data into many open source formats – as all the data is natively stored in ESRI SDE/MS SQL Server. What I am proposing – is to have MS Hololens display our GIS utility layers exported from our ESRI/MS SQL Server based GIS – to allow for field workers to literally “see” the utility lines beneath their feet – hands free – based on Hololens tilt sensor information and the fact that the GIS export includes the X/Y & Z coordinates of every GIS feature – Hands Free!. This would allow an electric worker to “look up” and “see” (by labeled attribute information from the GIS) the voltage and phase of the electric lines over his head. This would allow a gas company worker to “look down” and “see” that there is a gas line running 6 inches from a water line, 5 feet below where he is standing. Once developed and field tested – this application would be of great interest to every public and private utility company – throughout the world ! Thanks for writing. I’m sure our readers will be interested! Reprinted from Esri WhereNext Magazine.